Sawtrax Saws and Equipment from Rudolf Bass Inc.
For those looking for a 10" panel saw on a budget, look no further. Now have the ability to cut thicker material, like doors, or the convenience of using their 10" table saw blades in a panel saw for way under the $20,000 starting price of other panel saws. The 3000 Series Vertical Panel Saw doesn't require 3 phase power so you don't need to rewire your shop. Now the smaller, value oriented buyer has the ability to cut with the 10" saw blades like the $20,000+ machines at a fraction of the price. This series is ideal for customers that need to break down sheet goods up to 2 1/2 inches thick with precision cuts. We recommend this saw for all users needing a greater depth of cut or the finer cuts offered by the larger 10"saw blades. These are used for heavy duty cutting requirements or if you need the deep cut or precision of 10 inch saw blades. The 3000 Series adds to the 1000 series but uses a 10" Milwaukee saw and uses steel sleeves over the plastic rollers. The hypoid is a maintenance free version of the worm drive saw without the need for oil changes. This portable and small footprint dolly is great for indoor and office use. 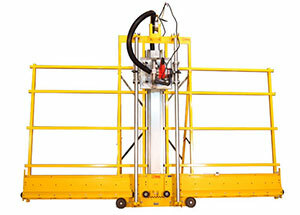 Offers excellent maneuverability and even fits on most rental truck loading ramps! Interchangeable post system offers maximum flexibility to move almost any load, from thin pieces like book shelves and TV's to large pieces such as couch, desks, or mattresses. 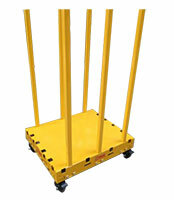 The Rack & Roll Safety dolly can carry 3 to 4 times the load of traditional flat carts or hand trucks while being easier, faster and safer to load. With the 8 posts it is ideal as a rolling rack for Sign shops to store material or move product to the printer or cutter. We can help you obtain new machinery from Sawtrax just ask us!